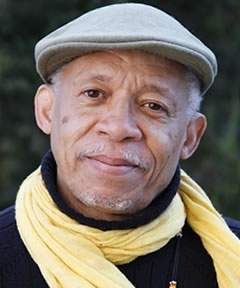 Born in Chicago of African and Native heritage, Louis Alemayehu, a multicultural elder, developed his poetic skills and musical sensibilities as a part of the Black Arts Movement in the 1970s. He believes that poetry is a tool for healing; his performances are lyrical twinings of jazz, chant, poetry and song with art-as-ritual, often performed ceremonially. He teaches Environmental Sustainability in Minnesota at the Higher Education Consortium for Urban Affairs, and facilitates the creation of Permacultural farms and early childhood schools in rural West African villages. He as well conducts workshops on Mindfulness Meditation and community-building. Louis serves in Common Ground’s advisory group, and is part of the Music Festival each September. He leads workshops at Common Ground for artists, activists, and community-builders. To listen to Louis’ talks, click here.